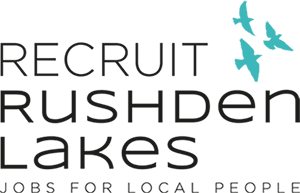 Recruit Rushden Lakes is a free recruitment programme set up by The Crown Estate. It will connect a talented local workforce with new jobs in the area. This in turn helps our retail and restaurant businesses at Rushden Lakes, together with other local businesses in the area, find and train the staff they need. Recruit Rushden Lakes will work with employers and agencies (including Jobcentre Plus) to match local jobseekers with vacancies, and to provide businesses with skilled, job-ready candidates. The Crown Estate, the owner of Rushden Lakes, is funding the launch of Recruit Rushden Lakes. The Crown Estate launched its first recruitment programme in 2009, with Recruit London, to help unemployed Londoners get jobs with employers in the West End. Over the last eight years, Recruit London has helped more than 1,500 people get work in London. The programme has since been successfully established in three further locations around the country – Leicester, Worcester and Exeter – with more programmes to follow later this year, including the launch at Rushden Lakes. Blue Mountain Yard – Responsible for efficient and profitable day-to-day management of all kitchen operations. Blue Mountain Yard – We are looking for individuals who enjoy working in a fun, vibrant environment. Blue Mountain Yard – We are a Jamaican street food restaurant, serving authentic Caribbean dishes. Blue Mountain Yard is a Jamaican street food restaurant, serving authentic Caribbean dishes. As a Team Member, you’ll be responsible for making sure every customer has an unrivalled cinema experience. Join us as a Sales Ambassador promoting sales of our fragrance range comprising best-selling brands Mugler and Azzaro. There are two key reasons why our guests visit Fridays – to eat our food and to be entertained. The Corner Bar is your stage. It’s your personality that makes you unique and ensures every guest experience’s is one to remember. At Skechers, our Supervisors make an incredible impact every day on our customers, team and company. We have exciting opportunities for Sales Advisors to join our team. Mint Velvet is about style you can just slip-on to look effortlessly chic – even on the busiest days. …We don’t do good times, only Great Times. That’s our secret sauce. We are in the business of creating magic and memories for our customers, beyond just their meal. Canoe2, a busy local Canoe Hire Company is now based at the Boathouse within the Rushden Lakes development and requires new team members to help this expanding business.